Seriously. Just when you thought the speculoos train had left the station. Nothing new to see here in Cookie Butter Town, folks. You got your regular. You got the crunchy, err, crispy. You got it in chocolate. You got it mixed with chocolate. There's cookie butter ice cream. And for those who like their speculoos unbutterfied, there's the regular ol' cookies. There's nowhere else to go with cookie butter, right? Right? Haha. Nope. We've only just begun! As amazing as speculoos cookie butter is....there's more than one fish in the sea and one kind of cookie in the world. Trader Joe's is aready pretty famous for their Joe-Joe's in all sorts of variations. Combine those Oreo clones with the cookie butter concept, and voila! 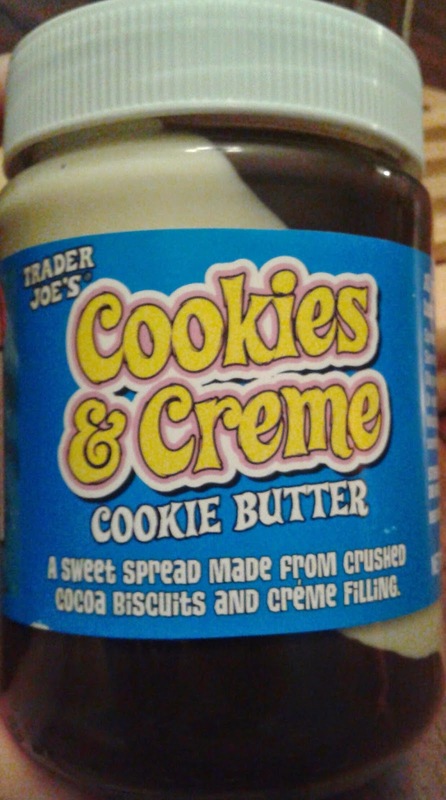 Here it is: Trader Joe's Cookies & Creme Cookie Butter. For those familiar with the concept (and if you're not, you're a better person than me), cookie butter is made from squished up cookies mixed with palm oil and all sorts of other bad stuff that tastes so darn good that most of us don't really care. The outcome is typically a spreadable, occasionally crispy butter, and this particular variation is much the same. It's only the chocolately parts that are like that as the white is a creamy, marshmallowy filling much like typical Oreo filling. Pretty literally, imagine eating an Oreo in a spreadable form that didn't require much if any chewing, and that's almost exactly what we got here. What have you wrought, TJ's!?!?! So, it tastes good...but what do you do with it? That's the big question for Sandy and I. 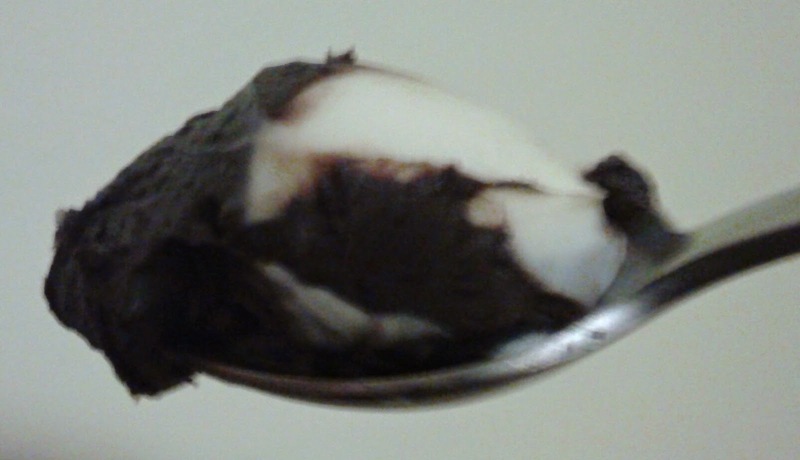 We sampled the good ol' 'merican way by taking our spoons directly to the jar. With some thought, we came up with waffles (maybe), toast (occasionally), pretzels, mixing into a smoothie or some ice cream, or eating from the jar. When I looked at the jar for perhaps some ideas, the label said all of the same. So, as tasty as the cookie spread is, it might be of some limited use, which as much as I enjoy all the other cookie butters, I see that as their weak point. Particularly tasty, not particularly versatile. We're open for suggestions here, folks. Also, and this just a small thing, really, but when I saw hazelnuts were an ingredient, I hoped the cocoa swirl would be at least a little Nutella-esque. It's not really. Oh well. Sandy and I will enjoy the jar we have, and while it's tasty, it's not tempting enough for me to bust loose on my diet for it (down 20 pounds in about 2 months! ), and once we're out, that'll probably be that. For the $3.69, though, it's a pretty good little occasional mini-indulgence. Matching fours. Sounds like it would be good on pound cake of smeared on top of vanilla cupcakes in lieu of frosting? Love your site! I think TJ's ( which we love to shop at) would put a bit of effort to keep their customers informed. 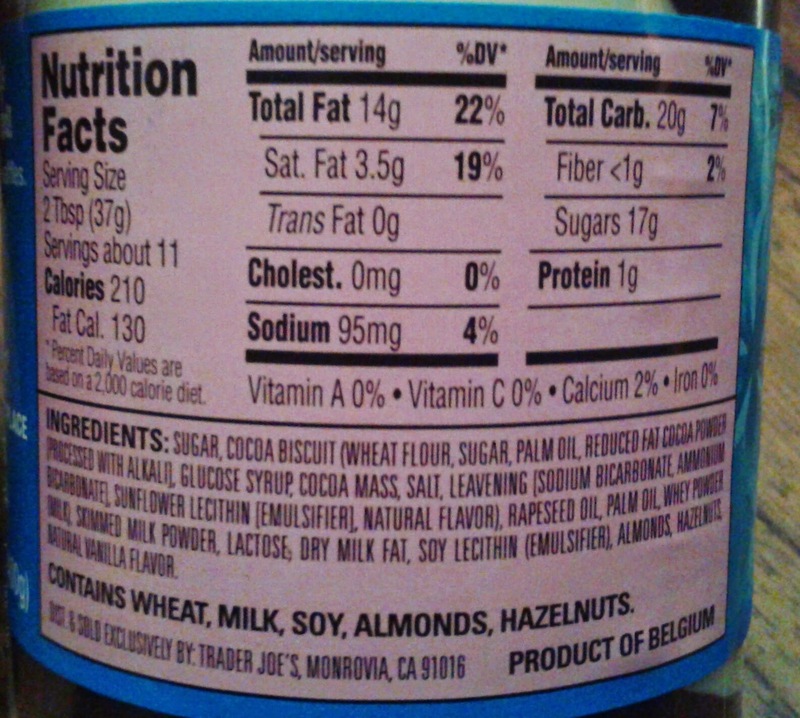 TJ's yellow & blue label is exactly the same as their JoJo's cookies, which does NOT contain nuts . FYI, they keep an updated list of products with allergens on their website. That goes back to the importance of reading ingredients - a quick look at the ingredients labels says in bold, big letters it contains nuts. My "small" comment was tied to the hope it would taste Nutella-like once I saw hazelnuts were included, not the inclusion of nuts themselves. I do sympathize with you, though, so that is one of the reasons we do our best to provide a clear picture of both nutritional info and ingredients with our reviews. There is a local bakery that sells a "crookie" which is an oreo-embedded in a croissant. I thought that sounded ridiculous, but when I tried it, it was phenomenal. It was basically a croissant with a filling that is exactly like the cookies creme butter from Trader Joe's. I imagine that the spread would be great as a filling for a pastry like our local "crookie"
Use it to make Cookies & Cream white trash / puppy chow / muddy buddies! Substitute Cookies & Cream Cookie Butter for melted semi-sweet chocolate morsels and peanut butter. Mix with Chex cereal and dust with confectioners sugar as normal.